Sony Alpha 850 leaked, looks exactly like the Alpha 900? 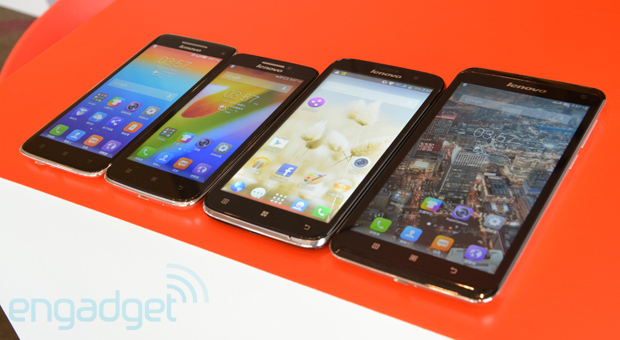 If you look around now, chances are you won't spot a single Lenovo smartphone nearby. Unless you're in one of the 15 countries -- mostly in emerging markets -- where the company's been rolling out its mobile devices since last year. JD Howard, the VP of Mobile Internet and Digital Home Business Group, was in Hong Kong earlier this month to extend Lenovo's reach with its super slim and light Vibe X, in addition to three similar-looking dual-SIM phones: the S930, S650 and A850. While there's a lot of catching up to do before entering mature mobile markets, Howard believes his company's off to a solid start, especially by bucking the trend and expanding its in-house manufacturing. 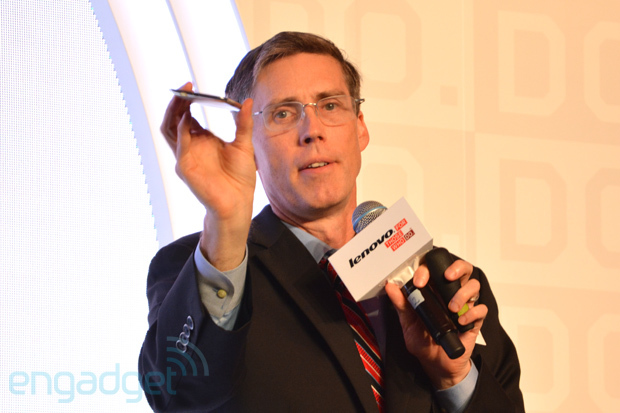 Howard pointed out that Lenovo's new $800 million Wuhan facility is coming online, which will increase the company's production capacity to 100 million units a year, including both phones and tablets. At a time when other companies are outsourcing their manufacturing to reduce costs, Howard said having its own "unparalleled supply chain" actually reduces the overall cost for Lenovo, and speeds up production as issues are either reduced or can be resolved more quickly. "A lot of the same skills and talents that you need to run operations for a PC business, we're applying that to smartphones," Howard said. "When you control your own supply chain ... you can actually get to market anywhere between three to six months faster than the competition." Part of this success also comes from Lenovo's status as an early adopter -- and now a main customer -- of MediaTek's turnkey solution, which allows vendors to quickly dress up reference platforms from the chip design company, thus saving time and money. Or in the case of Lenovo's thin and light Vibe X (plus similar offerings from Oppo, Vivo and Alcatel), vendors can instead focus on the industrial design and UI. While all four of Lenovo's new phones use MediaTek's solutions, Howard stressed that his company also has a "strong relationship" with Intel and Qualcomm -- both represented by the flagship K900 and the upcoming Vibe Z, aka K910, respectively. But he showed a particular fondness for Intel, and praised its dual-core Atom processor for enabling the K900 to run "as fast as some of our quad-core phones out in the market." "My understanding is [Intel has] more engineers working on Android than Google does right now." "You need to really pay attention to Intel. I think that someday they will be a major player in this phone ecosystem," Howard said. "On the PC side, they just build the densest, lowest power-consumption, best chips in the industry; they have the fabs; they can build the things. My understanding is they have more engineers working on Android than Google does right now. They are very, very serious. So, you know, keep an eye out." As for NVIDIA, he simply said he doesn't think it is necessarily mainstream in the mobile market, which could imply Lenovo currently has no Tegra 4-powered phones in the pipeline. On the other hand, ZTE, Xiaomi, Coolpad and possibly more Chinese brands are picking up NVIDIA's latest chipset for their handsets, which may change Lenovo's mind in the near future. On the topic of mobile OS ecosystems, Lenovo is unsurprisingly focused on Android in response to the resounding market demand for it, though that may change depending on how form factors beyond smartphones develop going forward. Howard added that for now, Tizen and Firefox OS have yet to build up momentum, but he wouldn't confirm whether his company is still working on a Windows Phone device. Back in January, the exec told ZDNet Asia that his team had pitched Windows Phone plans to the management, and a decision would have been made in April; so things aren't looking so good for Microsoft. We asked Howard whether Microsoft's acquisition of Nokia's device division would have put Lenovo off of the idea of adopting Windows Phone, and he was quick to defend his company's "major strategic partner" from Redmond. "No no no no, not at all," Howard replied. "Basically, the smartphone market is a very dynamic place. We really welcome that move, and we think that overall it's going to be good for the industry, and hopefully we'll kind of find a place in there to continue to partner with Microsoft and maybe look at other opportunities." Seeing that the eccentric Yoga Tablet was also featured at the Hong Kong launch event, we expressed our desire to see more new form factors for smartphones. Without giving anything away, Howard said we'd see Lenovo continue to innovate in that space, especially given the way the Yoga Tablet "was driven by very strong user interface research." "Stay tuned," Howard said. "Hopefully we'll have something very interesting to show you in phones some day; but for now, [we] are pushing the boundaries on thin and light."